I work in economic development with a focus on regional foods. However, I'm not really a food guy. My lifelong favorite food is peanut butter. Not exactly a foodie thing, but there it is. I thought I had tried every combination of peanut butter and (everything) sandwiches. Then a friend sent me the New York Times food article: Peanut Butter Takes On an Unlikely Best Friend. Yep. 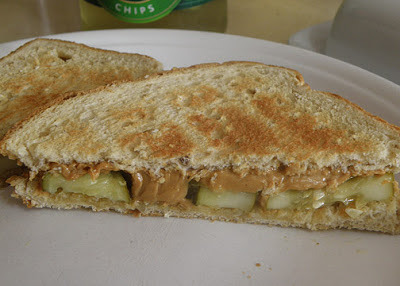 Peanut butter and pickle sandwiches. "LIKE Krazy and Ignatz, Carville and Matalin, Cupid and Psyche or Alison Krauss and Robert Plant, the peanut butter and pickle sandwich is one of those unlikely pairings that shouldn’t work, but does." I laughed then I made one. Then I made two. After the third, I'm hooked. Cucumber food facts, thanks to the Wisconsin Farmers Market Association: "Cucumbers do not contain an abundance of nutrients -- they contain mostly water but do have small amounts of lutein which is essential in eye health. Did you ever hear the phrase, "cool as a cucumber"? ... you'll find the inside of a cucumber to be 20 degrees cooler than the outside temperatures in the summer heat! Native to India, cucumbers may be one of the oldest cultivated vegetables."